Sun, sun, sun, sun, sun, sun, sun, sun, sun, sun, sun, sun, sun, sun, sun, sun, sun, sun, sun, sun, sun, sun, sun, sun, sun, sun, RAIN! The above graph shows depicts the height of the water table, i.e. 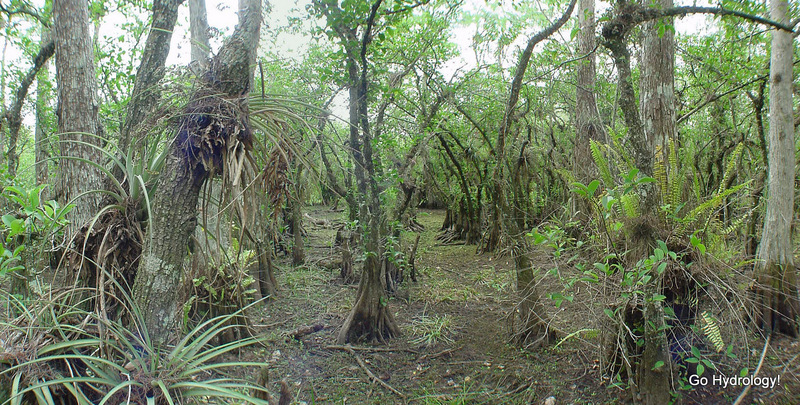 the bright blue line, in Big Cypress Nat'l Preserve relative to the bottom of the pond apple forest floor. Horizontal color coding is used to show the height of the major ecohydrological zones: red for dry season refugia, orange for pond apple forest, light green for tall cypress, dark green for marl prairies, light blue for hydric pines and dark blue for the pine islands. The white line shows the 20-year median stage. Thanks to last weekend's rain, the water table has risen close to the typical median value for late April. It always falls on a weekend! But did anybody else notice stout north wind, too? I wonder what this view looks like now? The ground was dry to the touch by Sunday afternoon.